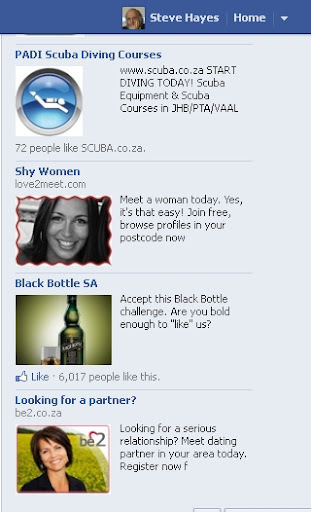 Does Facebook’s targeted advertising work? Facebook Ads are targeted according to your Facebook Profile information: Your age, location, education, relationship status, interests like favorite movies, music and much more are available to advertisers that can access to aggregate data and reach the right audience for their ads. Depending on their goals and the product that they are advertising, advertisers can set a targeting filter to select which group of people will see their ad. This makes it possible to focus on or target the people most likely to be interested in the product, amongst the 500 million worldwide Facebook users. Scuba diving, at my age? Living inland? Little black bottle coloured green? What’s to like? Looking for a partner? If I were single or divorced and 25 years younger, I might be, but given who I am, this is way off target. the BBC tested out Facebook advertising by running a campaign for the Facebook page of a fictitious small business called VirtualBagel. The investigation was headlined “Facebook ‘likes’ and adverts’ value doubted”. During the week over 3,000 people Liked the ads even though the company doesn’t exist and simply shows you a picture of a bagel. The ‘investigation’ is partly a reminder that Facebook still has issues with fake profiles and Astroturfing, but is also a simple re-stating of the fact that you get what you pay for and if you put up a dumb ad targeted too widely you’ll waste your money. And there are all those advertisers who ask you to “like” their ads or their produces. Perhaps that means you will see more of their ads, but even more important is that “like” means “Please send me spam”. People in the US seem to have a very swivel-eyed idea of privacy. They object to identity documents and the like, yet seem to put up with this sort of thing with hardly a squeak. To me this is real Gestapo/KGB stuff, and carrying an identity document is just part of normal life. It’s funny how cultures differ. Is a laptop searchable in the same way as a piece of luggage? The Department of Homeland Security believes it is. For the past 18 months, immigration officials at border entries have been searching and seizing some citizens’ laptops, cellphones, and BlackBerry devices when they return from international trips. In some cases, the officers go through the files while the traveler is standing there. In others, they take the device for several hours and download the hard drive’s content. After that, it’s unclear what happens to the data. To me that kind of thing implies that the State owns you, body and soul, and can steal your ideas, your inventions, and your secrets with impunity and no accountability. It’s what used to happen in South Africa in the bad old days. A fellow called Martin West did a lot of research on African Independent Churches in Soweto. Some of it was published in a book called Bishops and prophets in a black city , but the rest was stored in the Christian Institute offices and seized in an SB raid. It has never reappeared. Months of research just vanished. And now the US is doing the same sort of thing.